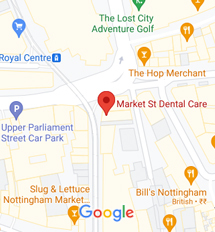 Welcome to Market St Dental Care in Nottingham. It is our aim to provide the highest quality dental care in a modern and relaxed environment. We are now currently accepting new NHS, Private, Denplan Care and Denplan Essentials patients. Denplan Care makes dental treatment more accessible by providing a payment plan to help you spread the cost. Included in this is insurance cover if you have a dental injury or emergency.